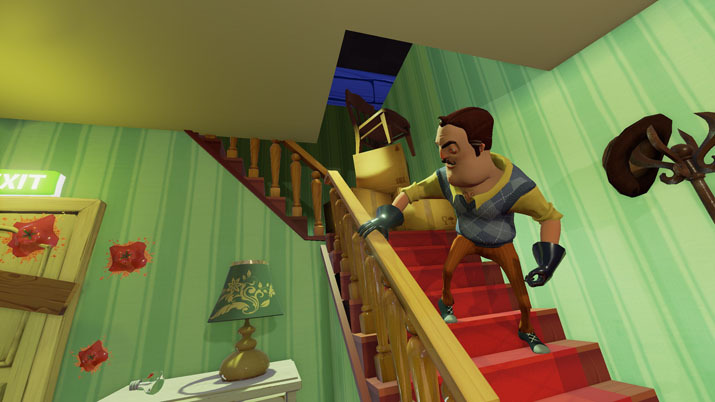 Hello Neighbor, developed by Dynamic Pixels and published by tinyBuild,is a first person stealth horror game set somewhere in the suburbs. Your neighbor lives in a unsettling maze of a funhouse and is nothing short of shady. Investigate your shifty neighbor — as he adapts to your methods of infiltrating his house. Use ordinary house objects as survival tools and figure out how to break into the areas of the house that he wants never anyone to see. TinyBuild has very consistently published quality indie games including, Streets of Rogue and Clustertruck: Is Hello Neighbor another game to add to their pile of well-received indie titles? The biggest problem with the current influx of horror games is their inability to hold an identity. Most developers have realized that simply being chased around corridors is not enough to make a game interesting. Many games suffer from boring linearity while others decide to put in puzzles to spice up the gameplay and really drive home that feeling of critical thinking under stress. On one hand, Hello Neighbor knows exactly how it wants to handle its puzzles, while on the other, it desperately wants to still be a horror game but just can’t deliver that fully just yet. Upon booting up the game for the first time, I was on edge based on my expectations. I lurked around his house, blocked doors, and was constantly staying still for long periods of time to ensure I didn’t get caught. Once the inevitable finally hit, I realized that there was absolutely no reason to be afraid of getting caught besides the jumpscares that have made me knock countless things over. Once I realized that I could go upstairs without him properly following me, I began to simply sprint into the house and up the ladder any time I died or was caught. There are only a handful of times that I can recall him ever catching me while anywhere other than the first floor. Although this is massively disappointing, I will give Dynamic Pixels props for creating such fantastic “nightmare rooms.” Nightmare rooms pull you into a separate world where evil sentient mannequins roam and hunt you down. Considering that they are by far the most interesting and abstract portions of the game, I refuse to say anything more because experiencing them for the first time is absolutely amazing. Hello Neighbor refuses to hold your hand at all. There are no hints, no checkpoints, and no tutorials outside of the opening one which directs you to pick some things up and open a door. In a world saturated with games that feel the need to hold your hand for things as simple as moving, I was instantly in love with being thrown in front of this mysterious man’s yard without any direction. A person is screaming and the neighbor is barricading a door that is locked, probably worth checking out. It does not take a rocket scientist to realize that a green lock needs a green key, it’s finding the green key and understanding how to get it from said room where the creativity kicks in. The puzzles do vary outside of collecting keys with the use of the great nightmare rooms. Truly, the game finds itself in these rooms where it knows how to balance horror and puzzle-solving, but doesn’t understand how to consistently keep this true to the game as a whole. 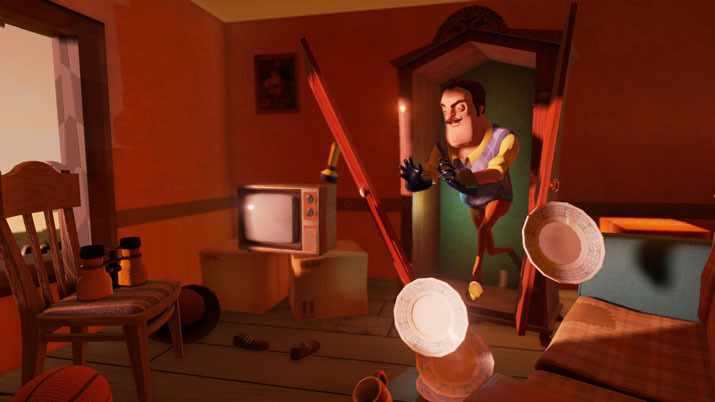 Hello Neighbor uses the Unreal Engine and it’s nothing short of beautiful. The Unreal Engine notoriously pumps out the same hyper-realistic looking shooters day after day, while Dynamic Pixels simply uses it to push their artistic vision to the next level. The lighting and color correction during the day gives everything a very nice, warm glow, while at night, the pitch-black house is gently illuminated by your flashlight. The character design is quite unique; the humans have large heads with stringy limbs and look almost clay-like without looking muddy. The mannequins are blank with stiff, hanging limbs but in movement prove to be agile and horrifying. Most importantly, the house in architectural design and visual is a work of art. One of the more anticipated features of the game was the promise that your neighbor would adapt to your playstyle to make the game get harder rather than easier over time. Is this true? Not exactly. The first time that I got caught, I came back to the house to see that the door which I had taken now had a bear trap. “Sweet!” I thought, thinking that this was only the beginning of a genius AI who would turn his house into a sadistically lethal paradise for Kevin McCallister. To my disappointment, the traps do not extend outside of cameras and buckets of water. The traps simply do not have much weight to them and it’s really sad to see such an interesting idea have such little weight on my decisions. I really would’ve liked to see the traps change up my plans but most of the time I simply walk around them or ignore their effects. I hesitate to dedicate myself entirely to the title of “great game” right now because it’s still enduring an identity crisis. If Hello Neighbor was just a puzzle game I would say that it’s really interesting but lacking something, while if it was just a horror game, I would say that it lacks any real depth or survival aspects for me to really care about at all. The elements for both are there, they just aren’t connected properly yet. The nightmare rooms and the art are proof that Dynamic Pixels knows what they’re doing and can deliver on their vision — hence the leniency on its current state. The main issue hinges closely on the interesting-ness of the house’s design, removing any buffer for middle-of-the-road gamers. Do not go into this game with high hopes in the horror department because ultimately all you’re left with is intense bass playing and a jumpscare from every pursuit. Rather than try and make a quick buck out of cheap thrills, Dynamic Pixels and tinyBuild took the popular trope of hide-and-seek horror and twisted it into something new and creative. There is a great game buried here as long as the development studio fixes the problems currently plaguing it... And if they can manage to really polish it, then the horror genre has much innovation to offer.